Glorious Gall – Let's Paint Nature! Do you know what that is? 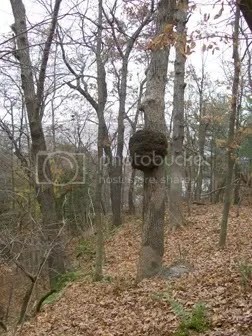 It’s a gigantic gall! 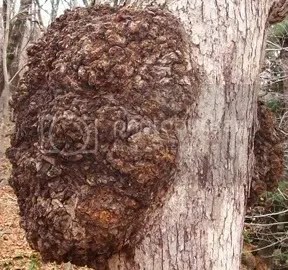 It’s so big, it can be referred to as a knot or tumor gall. You may have spotted galls, especially this time of year when the leaves have cleared and tree twigs are exposed. You may have seen galls on leaves too. Look on the ground when you take your nature hikes, I bet you’ll find some on oak leaves without even trying too hard. Isn’t it beautiful? I mean, for real? I love galls. What is a gall in the plant world? Typical galls are the result of insects depositing their egg inside a plant’s tissue. You may now ask…”Why do you love that so much? That sounds like plant damage!” Oh but no! That’s why I love galls so much. The insect gets his way and the plant gets her way. An insect deposits an egg by making a slit in a leaf or bud of a twig. The secretion (eeew!) from the insect that surrounds the egg, causes the plant’s cells to reproduce really quickly and abundantly. The plant cells start growing around the egg to protect it. Hence the excess plant tissue and really interesting looking galls. No harm done. The only damage done is a little disfigurement, which in my opinion is not a bad trait at all but rather a positive one in which I love you even more! PS The oak tree gall in the picture is so massive it could have been produced by fungi, insects, or/and mechanical injury. 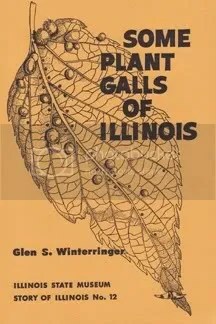 Why it’s my own 1961 copy of, “Some Plant Galls of Illinois”, by Glen S. Winterringer! Sold back in the day for .25 cents, I grabbed it for $1. OH BOY! What more can a girl want than a book about plant galls…I really don’t know? The University of Illinois at Urbana-Champagne, is going to give this book to you for free as a Christmas present, by clicking here and clicking on the PDF file. How do you like them apples in a recession? Have fun my nature friends! Pass it on! ← Let’s Paint Tree Roots! That book made me laugh…Who would think to do something like that, you know? I wish we had something like that for our area. This past summer I found cone-shaped galls on some plant leaves & I’ve been wondering what bug instigated them ever since! I’ve never heard of this before, altho I do think I’ve seen them, much smaller tho. Lana: lol. I know what you mean! Hopefully there’s some kind of book for your region. If I happen to see one I’ll let you know! Drowsey: You probably have seen mini versions on leaves or small twigs!!! How exciting. Pingback: No Bugs Only Blood…Mine « Let’s Paint Nature!